Vision therapy to improve eyesight with subliminal messages stands firm in front of lasik eye surgery that is supposed to be the last word in the field of ophthalmology today. In fact, there is more myth than truth that prevails over the world of ophthalmology right at the moment. Lasik eye surgery only engineers another lens in the cornea over the eyeballs replacing spectacles or the contact lenses rather than correcting the shape of the eyeballs responsible for all the errors of refractive index in the eyes. Most of the eye vision problems including myopia, hyperopia, presbyopia and astigmatism result from the eye musculature distorting the shape of the eyeballs in various different ways responsible for the various different eyesight problems named before in the sentence. The eye muscles keep the eyeballs habitually distorted in a particular way that a person has got accustomed to. What is it that accustoms a person’s eye muscles to keep the eyeballs distorted in the same particular way all through his or her life? Here comes the secret that ophthalmology is just unaware of! It’s the subtle alignment of the jaw-line that the two of the jaws maintain with each other in a habitual way that distorts the eye muscles which in turn distort the eyeballs so. Every single person does it a little or a lot differently from the rest of all the humanity, giving them the throw of personality that their face expresses it with. Every face tells a different story altogether characterizing its psycho-biological predisposition to keep its jaws subtly aligned the way it has done them in. Changing the biology of this alignment through opening the third eye and the crown chakras instantly changes the distortion of the eye musculature which in turn changes the distortion in the shape of the eyeballs that it has habitually kept generated in them since long, making it the ocular personality of the person concerned. I, as a natural vision therapist, personally take care of the biological part through opening the said chakras in my Single Person Chakra Opening Workshop comprising two 8-hour sessions on two consecutive days. But what about the psychological part of this psycho-biological predisposition that almost every single person falls a victim to, making wearing spectacles necessary after 40 years of age for presbyopia, in case the person had not fallen victim to myopia before? It’s like an uphill train being pulled by an engine in front along with being pushed by another at its back that makes it easily climb the slope of the hill up to its top. The psychological part makes that second engine without which the first engine, i.e., the biological realignment would go devoid of energy to keep the realigned jaw-line the way it should be kept in order to improve eyesight in a permanent way, 24 x 7! Subliminal messages take care of this psychological part through providing it with an unbound store of the subconscious energy dealing with the intent as well as the interest in what the biological realignment of the jaw-line changes at the level of the ocular personality interacting with the world around from moment to moment, every single moment. Vision therapy done in this particular way combining subliminal messages with chakra opening procedure comes up with the best possible results in the most natural way, unlike lasik eye surgery that only surgically engineers the cornea of the eye turning it into two biological lenses replacing either the spectacles or the contact lenses on the top of the eyeballs. I even personally know of quite a few people who went for their lasik eye surgery correcting their eyesight then, only to fall back to their old blur within a few years again. Ultimately they had to resort to the natural vision therapy comprising natural ways to improve eyesight, coming back to me in order to learn how to improve eyesight naturally again, for lifelong this time! What I propose here is dealing with the psychological part of this revolutionary vision therapy to improve eyesight with the help of subliminal messages before you embark on the biological part of it through opening the third eye and the crown chakras. This way you will be able to get an uninterrupted supply of the subconscious energy of intent and interest at the psychological level that would be required to deal with the biological initiative into it as and when you give it the final blow, correcting your eyesight more instantaneously than lasik eye surgery does! You will need using these subliminal messages regularly for a few weeks embedding them deep inside your subconscious mind in a lasting way, before you embark on the biological part of this natural vision therapy to improve eyesight in a permanent way, for lifelong. 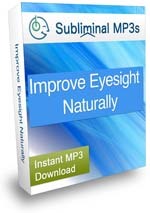 If you haven’t tried Improve Eyesight Naturally Subliminal yet then the time has come for you to increase your psychological energy level with subliminal messages for the natural vision therapy to improve eyesight through opening the third eye and the crown chakras without getting your natural corneas compromised surgically at the hands of lasik eye surgery.